Holiday Craft Projects with Kids - Joyful Toddlers! Children thrive when we slow down and do things with a “sense of spaciousness”: the attitude that we have enough attention for our task AND the child(ren), and that we have all the time in the world for whatever is happening right now. During the holiday season it can be especially hard to slow down. We still have everything we normally do, plus holiday parties, shopping for gifts, decorating the house, and more–More–MORE! We want to create magic for our children, but instead it seems like we hardly have time to pay attention to them at all because we’re so busy with everything else! I’m offering some suggestions for simple craft projects that are toddler and preschooler friendly. However, I don’t want these to be an additional task for your already-busy-schedule, nor do I want them to be one more thing to add to your Guilt List of things you’re not doing that you SHOULD be doing. If you decide to do these, use them as an exercise for being present with your children, for practicing that sense of spaciousness, or for being “busy but available” to allow your child to dive deeply into her own play. 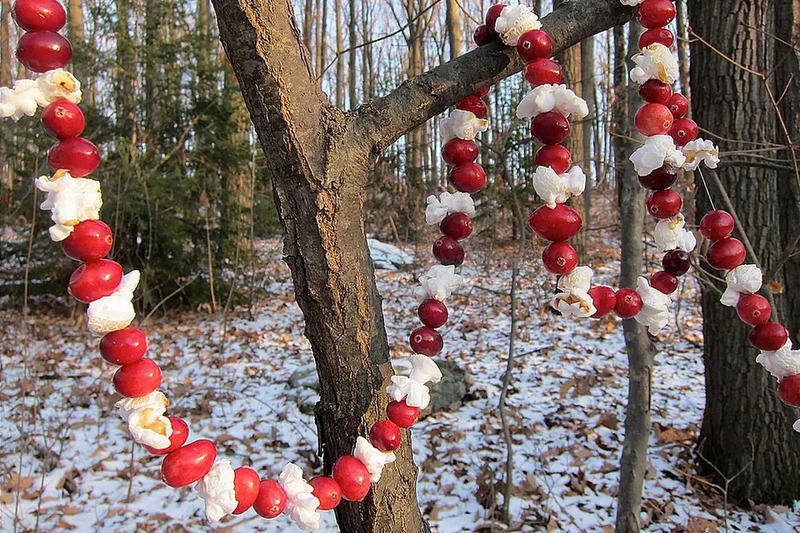 Sit down, slow down, and thread some cranberry garlands. Preschoolers are likely to be interested, but your toddler will likely be interested for a few moments, then wander off. Let her! Continue your craft at the same slow pace, chat with her if she wants to, or let your activity become a bit of a meditation as your child plays. She is still well aware that you are there and emotionally present. After awhile your toddler will come back again, and if you’re still doing your task in that spacious way, she’ll want to be involved again. Let her touch the tip of the needle to see how sharp it is, pick the berries, pull the thread. You have all the time in the world for what is happening right now. Three years from now, you’ll pull this wizened strand of cranberries out of the box of holiday decorations and you’ll smile, because you’ll remember a moment of calm presence in the middle of the hectic holiday season. This is an activity that I have fond memories of as a child. Seeing the cheerful white and red swag on the Christmas tree, or over the mantel, or strung along the trees outdoors for the birds and squirrels to eat, brings a smile to my heart. I usually use waxed dental floss to string them (rather than thread) as the items slide along easily, and it rarely breaks. Use a big darning needle and tie the floss to the end to let your toddler or preschooler thread their own. 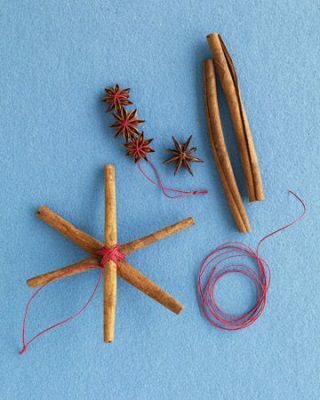 Fill your home with the warm smell of cinnamon with these sweet ornaments; all these require are cinnamon sticks and red floss. I’ve never made these before, but I think I’ll try it this year with my four-year-old. For craft projects like these I prefer using Tapestry Thread (sometimes called crewel thread) instead of embroidery floss, since it doesn’t have the six threads that come apart. However, either would work, as would regular thread or even ribbons. This photo also shows dried anise, which I think is a great idea! These are one of my seasonal favorites! 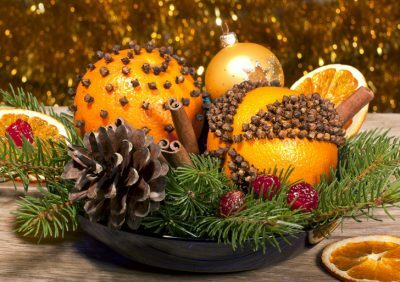 Just oranges and whole cloves; you can add ribbons too if you want to hang them. In order to make it easier for little fingers, use a toothpick to poke a hole, then let your toddler put the clove in. If you want to attach a ribbon to hang it, you can keep it in place with dressmaker pins (just leave the pins in). Finally, don’t forget to have fun! Doing things slowly and with a sense of spaciousness doesn’t mean that you can’t laugh and smile! If your child is a bit older, tell stories from when you were a child. You don’t have to get the whole thing done in one sitting; get a basket or a bag and put that half-finished pomander away until the next time you’re ready to slow down a little and connect with your child. When you finally finish, let your child help to put it in its final place and don’t forget to stand back for a moment and admire your work together. Children do best when surrounded by warmth, beauty, and love. Let these cinnamon ornaments or pomanders be a vehicle for that.